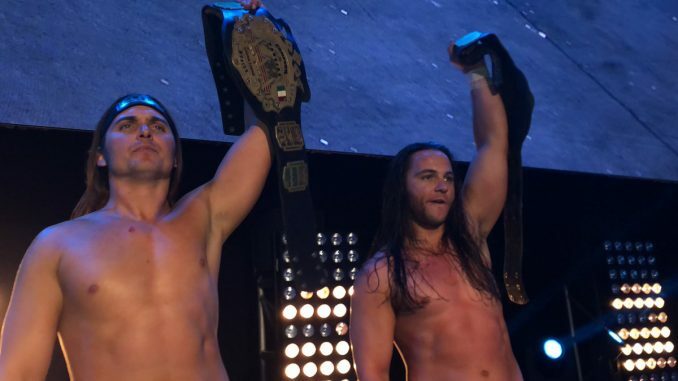 The Young Bucks win the AAA tag titles, a ladder match for the ROH title is announced for MSG, matches announced for Raw in Chicago, the UFC's welterweight picture & lots more. **Later tonight, we will have a bonus show up for members of the POST Wrestling Café. WH Park will be joining me as we go through the list of award winners from this past week’s issue of the Wrestling Observer Newsletter and their year-end awards. **If you missed it, Mike Murray and I did a POST Show on Friday night with a review of the ROH 17th Anniversary pay-per-view. We discussed the booking of the show, the debate over the 60-minute draw and how it came off, the plans for the G1 Supercard and lots more covered. **We also have the latest edition of The Rocky Maivia Picture Show with Nate Milton joined by Garrett Martin of Paste Magazine and Kris Ealy to review “Walking Tall” starring Dwayne Johnson. Nate’s show runs on the third Saturday of each month as he chronicles the cinematic frontier blazed by The Rock. This show is also available on the main POST Wrestling RSS feed. **I’ll have a list of shows out Monday morning for the forthcoming week and have several interesting ones planned with Wai Ting on vacation, including guest co-hosts for Rewind-A-Raw and Rewind-A-SmackDown. The only show we won’t have this week is the Café Hangout, but there will be a show in its place on Thursday afternoon. **Tuesday’s episode of SmackDown Live from Indianapolis will feature Kofi Kingston running the gauntlet against Samoa Joe, Rowan, Sheamus, Cesaro, and Randy Orton to get his title shot against Daniel Bryan. There will also be a segment involving The Miz responding to Shane McMahon. Tuesday’s tapings will include the finals of the 205 Live tournament with Cedric Alexander taking on Tony Nese and the winner challenging Buddy Murphy for the Cruiserweight title at WrestleMania. **Ring of Honor held their television tapings Saturday night in Las Vegas at Sam’s Town Live. The major news from the show was that the ROH title match at the G1 Supercard will now be a three-way ladder match involving Jay Lethal, Marty Scurll, and Matt Taven. This follows Lethal and Taven going to a 60-minute draw on Friday’s pay-per-view and Scurll leaving with the title after the match. Taven had been going around wearing his own replica title, but the title was destroyed by Lethal on last weekend’s television program. With Kota Ibushi eliminated, I’m expecting that Zack Sabre Jr. is going all the way to the final so that his first loss in the New Japan Cup is a big deal, which they are making it out to be. It would seem based on the pairings, to be Okada and Ishii in the semi-finals as Yoshi-Hashi would be a major letdown with so many big matches. On the other side, I see Zack Sabre Jr. beating Tanahashi and could set up a rematch at Madison Square Garden or on a future show. I see Sabre beating Sanada in the other semi-final and Okada winning the tournament over Sabre in next weekend’s final. **During Saturday’s EVOLVE 124 card in Queens, a video aired with The Undisputed Era to announce that Kyle O’Reilly will challenge Austin Theory for the EVOLVE title at their next card during WrestleMania week. The match will take place at EVOLVE 125 on April 4th at La Boom in Queens at Noon. **There was an injury sustained by Josh Briggs on the same EVOLVE card on Saturday. Briggs was down and had to be taken to the back on a stretcher. Briggs has since provided an update that he suffered a dislocated hip and will be out for 2-3 months. He also posted a video from the hospital where he was moving around on crutches. **WWE Network News is reporting that 20 additional episodes of WCW Thunder will be added to the WWE Network on Monday. The episodes begin September 2, 1999, through January 26, 2000. This would include the transition from Kevin Nash to Vince Russo and Ed Ferrara in October, including Nash joining commentary for his final Thunder, which is a ridiculous episode. They end on January 26th, which is the week before The Radicals debut on WWF television and right after Vince Russo was sent home with the committee led by Kevin Sullivan taking over the booking. **A new episode of WWE Photo Shoot will debut Monday night after Raw featuring Natalya on the WWE Network. **Greektown Wrestling has a card in Toronto next Sunday at 310 Danforth Avenue. The show will feature Mikey Whipwreck and Tajiri taking on The Frat. It will also feature Jazz defending the NWA women’s title, Little Guido taking on Jock Samson, DJZ vs. Kobe Durst and RJ City vs. Space Monkey. **WrestleMania X-8 took place on this date in 2002 from the SkyDome (now Rogers Centre) in Toronto, Ontario. While it was Chris Jericho and Triple H that went on last for the Undisputed title, the main event was The Rock taking on Hulk Hogan in Hogan’s first WrestleMania since 1993. In terms of atmosphere, it is still probably the most-heated match I have ever attended with the atmosphere making the match. The match has taken on a new life because of so many modern-day performers growing up with that match being larger than life. Cody and The Young Bucks have stated it’s their favorite match of all-time. In terms of performance, Hogan understanding how to play the legendary figure that would become sympathetic in defeat, it was masterful. While the match lasts under 17 minutes, the performance went several minutes longer with Rock and Hogan fighting off the N.W.O., Hogan endorsing The Rock while clutching his ribs. It was Hogan at his finest in taking a reaction and amplifying it for maximum impact. It was no surprise he was viewed so favorably in Montreal that week on television and parlayed this return into a brief title run. **Saturday’s UFC card at the O2 Arena drew 16,602 and a gate of $2,400,000, which are phenomenal figures for a Fight Night card. London is one of the UFC’s best markets in the world and there has never been a disappointing attendance figure since they began running at the O2. **Considering the reaction Masvidal has received, landing the impressive knockout victory, and his demeanor after the backstage issue with Edwards, he feels very special coming out of the weekend. It’s like the time Nate Diaz defeated Michael Johnson, cut a promo on Fox ripping apart Conor McGregor and had this momentum behind him. Masvidal is angling for the next title fight against Kamaru Usman and Usman’s manager is pushing for Masvidal ahead of Colby Covington. It’s interesting as Masvidal and Covington are teammates but Masvidal said he would take the title fight over Covington without any hesitation. The welterweight division has a great mix of fighters in the top end of the division. Usman and Covington seem like the next fight to make while Ben Askren is becoming a valuable entity with several potential fights you can line up for him. Masvidal may have booked his next fight without realizing it as it makes a lot of sense to do the fight with Roberts because of this incident and the fact it was covered so heavily on ESPN and other platforms. It’s unknown where Tyron Woodley and Darren Till will go next coming off their losses but welterweight is very compelling and lead into next weekend’s main event. **The UFC is running a Fight Night event next Saturday in Nashville, Tennessee at the Bridgestone Arena with Stephen Thompson taking on former lightweight champion Anthony Pettis. Pettis is moving up from lightweight after his loss to Tony Ferguson last October. Thompson is coming off a loss to Darren Till last May. The card will also feature two surging flyweights in Jussier Formiga and Deiveson Figueiredo, who in theory, would be fighting for a title shot, although the future of the division is unknown. The main card also features 20-year old Maycee Barber, whose goal is to become the youngest champion in UFC history. She competes in the flyweight division and is fighting JJ Aldrich next weekend. **John Morgan of MMA Junkie reported Molly McCann did break her orbital bone during her fight with Priscila Cachoeira on Saturday. Morgan spoke with McCann, who stated she was scheduled for surgery on Sunday. A review of the post-Fastlane edition of the show with Shane McMahon’s explanation for his attack on The Miz and confirmation of their match at WrestleMania, Randy Orton drops a “Dixie Carter” reference & more. John Pollock and Wai Ting review WWE Raw featuring a face-to-face involving Triple H and Dave Batista, Kurt Angle announces his retirement plans, Ronda Rousey annihilates Dana Brooke and a farewell address from The Shield.